EGYPTAIR was established in May 1932; it was the seventh airline in the world. Throughout more than 78 years of service, we have successfully extended our network to reach major destinations all over the world. The nine subsidiaries Our fleet consists of 65 aircrafts and includes a mixture of a long, medium and short haul as well as Cargo aircrafts with an average age of 8 years. The Fleet includes the latest generation of aircraft: B777-300 ER, B777-200 , A330-300 , A330-200, A340, A320, A321 , B737- 800 B737-500, Embraer 170 and A300-600 freighter and planning to reach 72 aircraft by the end of year 2014. Safety and the pursuit of operational excellence remain our top priorities and we continue to audit and enforce the highest internationally recognized safety standards. To secure the position of EGYPTAIR in the world markets, the company strives to benchmark its operations against internationally recognized standards. This involves obtaining and maintaining certificates by international bodies such as: IOSA –IATA Operational Safety Audit, EASA – European Aviation Safety Agency, ISO –International Organization for Standardization and ISAGO –IATA Safety Audit for Ground Operations. 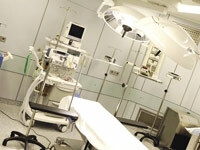 We plan to maintain this international recognition through continuously upgrading our human capital and our systems. On the 11th of July 2008, EGYPTAIR officially became the 21st member of Star Alliance. 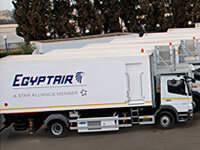 EGYPTAIR is the nation’s flag carrier and will strengthen the alliance network throughout Africa and the Middle East. EGYPTAIR EXPRESS is a scheduled domestic and regional airline established in May 2006, and is a subsidiary of EGYPTAIR HOLDING and was launched to improve domestic service and compete in regional short haul markets. 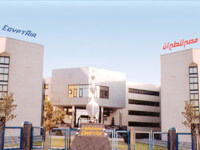 The company’s main base and major operations are in the Cairo International Airport with a smaller base in Alexandria (Nozha Airport). 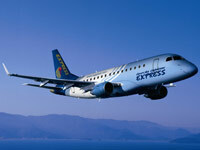 The fleet consists of 12 EMBRAER ERJ’s 170 LR . On the first of June 2010, EGYPTAIR EXPRESS celebrated its third year of operation and the expansion of its operation to include 27 domestic and international routes covering 18 cities. The company’s future plan will focus on expanding domestic network using Cairo International Airport as a domestic hub. The regional network will also expand to cover a number of south European destinations. 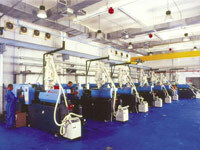 EGYPTAIRCARGO was founded in 2002 as a subsidiary of EGYPTAIR HOLDING. 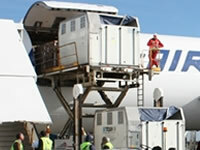 Since its foundation, EGYPTAIR CARGO has been on the forefront of transporting and handling general and special cargo. The EGYPTAIR CARGO fleet is composed of four medium range wide body aircrafts, two A300 B4 Freighters and two A300 -600 Freighters. The bellies of EGYPTAIR passenger planes are a significant capacity added to EGYPTAIR CARGO air transport capability as EGYPTAIR flies to around 70 major international cities in Europe, USA, Canada, Africa, the Gulf and the Far East. EGYPTAIR TOURISM ( KARNAK ) & DUTY FREE is comprised of two separate business sectors: Duty free: provides duty free retail services to passengers at nine major airport locations throughout the country as the largest duty free retailer in Egypt. Karnak Tourism Services: provides inbound and outbound touristic / conferencing services and operates a fleet of passenger vehicles of varying sizes especially for tourism. 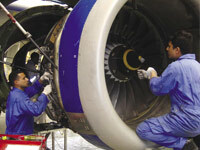 EGYPTAIR MAINTENANCE & ENGINEERING achieves an aggressive breakthrough in order to be a reputable independent MRO using the state-of the-art in providing maintenance services for different types of aircraft, aircraft’s engines and components. EGYPTAIR GROUND SERVICES was the first ground handling company to operate in Egypt and in the Middle East, lunching in 1938. We gained the trust of our customers with over more than seventy years through serving in all Egyptian airports; Cairo, Alexandria, Borg Al Arab, Sharm El Sheikh, Hurghada, Aswan, Luxor, Marsa Matrouh, Taba, Al Arish, Assuit, New Valley and Abu Simbel. 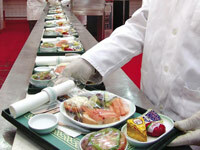 Manufacture of non-structural items and all other plastic items used for in-flight catering services. Manufacture of all printed materials for administrative activities as EGYPTAIR Print house has the advantage of having the three main production stages under one roof.